When tourists see my Alaska Weather Calendar a certain percentage chuckle and ask “is is accurate?” What they’re assuming is that I’m forecasting the weather for the entire next year (almost a two year forecast since I print the calendars the spring previous to the calendar year). They liken it to the Old Farmer’s Almanac. It is hard enough to predict the weather three days in advance and usually fruitless to make a specific forecast for seven days out. So am I going way out on a limb in taking a stab at the coming winter? Will I be like the cartoon characters who cut off the limb while standing on it? Most of Alaska is predicted to be below normal in temperate, but the precipitation forecast calls for “equal chances” of above or below normal, which to say there is not enough certainty to say one way or the other. Note that there is no snow forecast…since snow depends on precipitation and temperature, the variables are too tricky. I’ll take a shot later, after a little on what might help one in this situation. Also note that the forecast only goes through February, which even southerners know does not nearly cover winter in Alaska. The southern oscillation is measured as temperature and wind patterns in the tropical Pacific, but when these elements flop back and forth (or somewhere in the middle) there are connections to the weather over a far wider area, perhaps half the globe. Here’s an easy-to-read graph showing the cycles from 1950 to 2010. 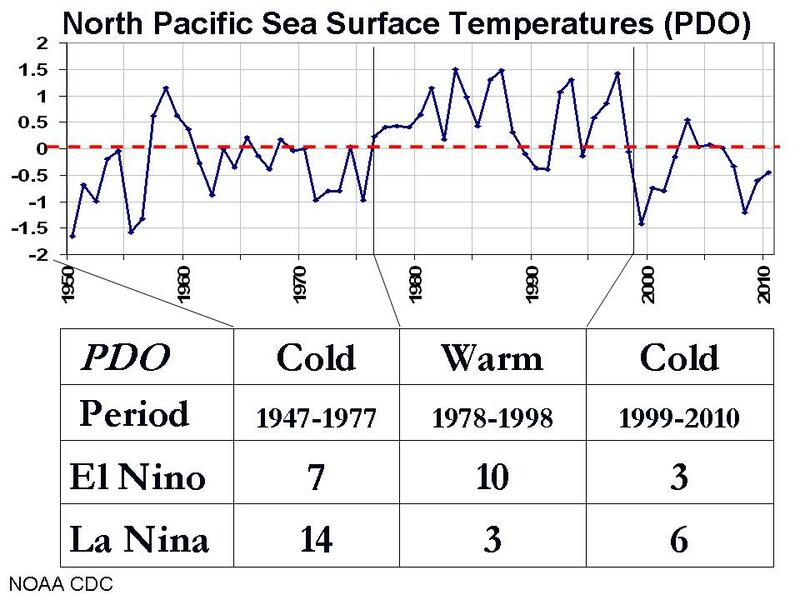 When the graph is far up in the red the ENSO is in the warm phase or El Nino. Significant dips into the blue are La Nina Periods. During El Nino winters, Most of Alaska is warmer and often wetter. Strong jets of warm air from way south in the Pacific visit more often, bringing episodes of above-freezing temperatures and rain, even in the midst of the winter. [As I write this Anchorage, Fairbanks and most points between and even further north are just getting through a terrible freezing rain event that would seem more consistent with an El Nino instead of the strong La Nina we seem to be headlong into. This reinforces that there are no absolutes, only generalizations.] La Nina generally means colder winters, often drier. For northern areas such as Fairbanks and north, a cold winter pretty much equates with less precipitation including less snow. For Southeast Alaska, colder usually also correlates with less precipitation, but because SE gets a more even mix of rain and snow in the winter, and a colder winter shifts more of the precipitation to snow. Its not hard to get more snow out of less precipitation; remember an inch of precipitation means an inch if it’s rain but 10-30 inches if it’s snow. As I mentioned in passing, the ENSO is shifting decidedly negative, so a moderate to strong La Nina is expected through the winter. You can read more about it at the Climate Prediction Center. Since the ENSO cycle was discovered many years ago, many more ocean-climate cycles have come to light, including an important one for Alaska, the PDO. The PDO also is keyed to Pacific Ocean temperatures, but over a much larger tropical and extra-tropical area. The time scale is also different. It tends to switch phases roughly every 20-30 years, rather than 1-3 for the ENSO. However, the two are related, not surprisingly. After all they both have to do with Pacific sea surface temperatures. This graph is nothing short of stunning from a climate statistic standpoint. 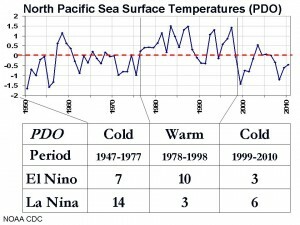 After 1977 there is only the one big stalactite into below-average temperatures (in 1999), and that correlates to a slip of both the ENSO and PDO into the cool phase. Hold that thought about the cool 2008. 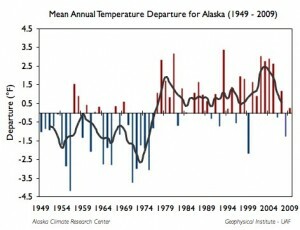 It’s not too surprising that a warmer Pacific means a warmer Alaska and vice-versa. But what forecasting value does it have? Much. First, the sea changes much more slowly than the weather patterns, so the current state of the ocean can help project weather regimes and averages much further foreword than traditional weather forecast techniques and technology. Please remember the difference between “weather regimes and averages” and a “traditional weather forecast” as discussed in the third paragraph of this post. So let’s look ahead. For this winter, confidently going to be an La Nina winter and likely a strong one, I’m agreeing with pretty much everybody in expecting colder than average for most of AK, more snow in Southeast Alaska, possibly more snow in Southcentral. I’d love to hear any comments, questions or complaints from skiers and non-skiers alike. Use the comment link below. Nice description of the PDO. That Alaska temperature departure plot is pretty amazing. So, we’re still reporting our climate normals from the 1971-2000 average. With such a strong PDO signal in Alaska, and our period for climate averages stuck in the warm phase, isn’t it about time we switched to a different system for talking about the “average” climate? Perhaps this can explain why the official “average” annual snowfall in Haines is 133 inches (a la: http://www.wrcc.dri.edu/cgi-bin/cliMONtsnf.pl?akhain). Yet the last several years here have been much snowier than “average”. It also doesn’t help that they stopped recording snow depth at the airport. Perhaps if we were to use the records from say 1949-1977 to calculate our average snowfall in Haines, we would find that the last several winters haven’t been much above average at all! Score one for the Haines winter recreationists! I too have my fingers crossed for a deep winter. And even better, a local backcountry hut system! years later, there is little doubt that he was correct. approximately 12,500 year cycle, not just a century long ‘mini’ ice age. of weaker PDO warm cycles, with the cold phase becoming more dominate. high elevations and high latitude land areas. cover trends need to be observed over a period of more than one PDO cycle. matching past PDO cycles to credibly validate climate change.